Personalized, private consultations are available for residents in the Orange County and LA County area of Southern California. 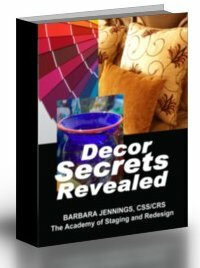 Consultations are provided by Senior Decor Specialist, Barbara Jennings, who is the author of all of the training books on this site. Ms. Jennings will be happy to schedule a private appointment at your convenience and come to your home personally to assist you in solving your decorating problems (yes, you get Barbara Jennings herself). You may elect to receive a one hour initial consultation to discuss all of your decorating needs according to your priorities. A minimum fee will be required of residents who live some distance away from the Huntington Beach office. If you choose, you may then elect to have Ms. Jennings work hand in hand with you to completely redecorate one or more rooms in your home, using the furnishings you already have. She will assess your most problematic rooms, make suggestions on where you should consider starting, then plunge in and literally move furniture and accessories around until your room or home is beautifully arranged, just like the homes you see in decorating magazines. Most redesign services can be completed in one day or less. Ms. Jennings has been doing reDesign for homeowners since 1986 and is the West Coast pioneer in this type of redecorating concept. Her services are professional and guaranteed to make you happier than you were before, or she will put everything back the way it was when she arrived. Guaranteed! In 17 years, she has never had to put anything back where it was before. You may pay by cash at the appointment or by Mastercard, VISA or Discover at the time you make the appointment. Please fill out the form below and submit directly to Barbara Jennings and she will return your call (usually the same day) or you may call her at (714) 963-3071. How Can We Help You the Best? Click the button above to request a Consultation Response. WE SPECIALIZE IN THESE TOPICS: INTERIOR REDESIGN TRAINING - HOME STAGING TRAINING - CORPORATE ART CONSULTING TRAINING - INTERIOR DECORATING TRAINING - DECORATING - REDECORATING - DECORATE - REDECORATE - INTERIOR DESIGN - INTERIOR DECORATING - INTERIOR REDESIGN - INTERIOR REDECORATING - FURNITURE ARRANGING - FURNITURE PLACEMENT - FURNITURE ARRANGEMENTS - INTERIOR REDESIGN TRAINING - HOME STAGING TRAINING - ONE DAY DECORATING - QUICK DECORATING - FAST DECORATING - EASY DECORATING - COLOR CONSULTATIONS - COLOR FORECASTS - HOME IMPROVEMENT - DECORATING TIPS AND MUCH, MUCH MORE!